Thermal Imaging - find possible electrical problems beforehand - Power Electric Inc. Thermal Imaging – Examples of digital shots taken first then taken with a thermal imager. Commercial businesses are often asked by insurance companies to conduct an infrared electrical inspection or Thermal Imaging Survey as a risk management tool. Specific training and certification is required to conduct an accurate Thermal Imaging Survey of your electrical components within your HVAC system. Today Thermal Imaging plays an essential part of any building’s electrical safety monitoring as it is well known throughout the industry that most industrial fires begin as an electrical fault. Power Electric & Mechanical Contractor Inc.’s technicians are fully trained to conduct a thorough Thermal Imaging Survey of your building’s HVAC and electrical systems to identify any possible problems which may be present that you most probably are not yet aware. Is your electrical plant and equipment maintained or checked regularly? If not, this can result in sudden failure of the equipment with potentially catastrophic failures, irreparable damage, costly down time and loss of production. Think about it, not only is Thermal Imaging a useful tool for your HVAC system, but also for ANY electrical powered device/system you may have within your facility such as CNC Mills, lathes, looms, over-head lighting or even your transformers/electrical boxes supplying power to you firm’s IT network. Thermal Imaging, or thermography as it is also known, detects heat patterns or temperature changes in objects. These changes point to possible electrical problems which could manifest into costly downtime. Also these temperature changes could signal a need to monitor developing situations that have not yet reached a critical stage and allow maintenance to be scheduled during a planned downtime to address these potential problems. A Thermal Imaging Survey is a report generated upon using a hi-tech digital thermal camera that highlights areas within your HVAC system or any electrical equipment within your facility where excessive heat is being emitted. All electrical equipment heats up in normal use however if a fault is developing then the heat being emitted will increase and will be be detected by our very sensitive cameras. Surveys of electrical systems can identify poor connections, overloaded circuits and imbalanced loads and once an initial survey is completed it becomes your baseline from which to compare in future surveys. Thermal Imaging Surveys should be included in any Preventative Maintenance Program because down time due to an electrical fault is both time consuming and expensive. A Thermal Imaging Survey is a non-intrusive service which will identify any problem areas and allow for preventative maintenance before a full breakdown occurs. Thermal Imaging Surveys are conducted without the power being turned off to identify faults within electrical systems and without any direct contact being required which make them more safe to conduct when inspecting electrical components. Thermal Imaging – How do thermal imagers work? Much like digital cameras, thermal imagers uses a detector which measures infrared energy instead of seeing visible light like digital cameras and captures this energy. These measurements are then used to create a thermal image by assigning colors to correspond with certain temperatures (see photo). A faulty or improper electrical connection can generate additional heat and therefore reduce system efficiencies. Faulty or improper electrical connections have the potential to cause more serious damage; in fact they are the biggest cause of electrical fires! Since all electrical connections deteriorate over time, it is important to establish a baseline and conduct scheduled scans to be as proactive as possible. 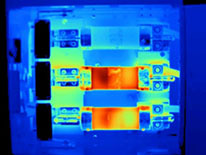 Thermal imaging can be utilized to detect and then repair in advance so as to prevent any such failures from occurring. Power Electric & Mechanical Contractor Inc. includes Thermal Imaging Surveys in all of its Preventative Maintenance Programs. The extra “peace of mind” that Thermal Imaging Surveys provide is the main difference from which our customers benefit. If you would like to experience that extra “peace of mind”, become one of our customers by calling Power Electric & Mechanical Contractor Inc. at 215-538-9716 or 610-972-1017.